Fresh Off The Boat stars Randall Park as Louis, Constance Wu as Jessica, Hudson Yang as Eddie, Forrest Wheeler as Emery, Ian Chen as Evan, Chelsey Crisp as Honey and Lucille Soong as Grandma Huang. This week, Cattleman's Ranch serves as a polling place for the 1996 Clinton vs. Dole presidential election. 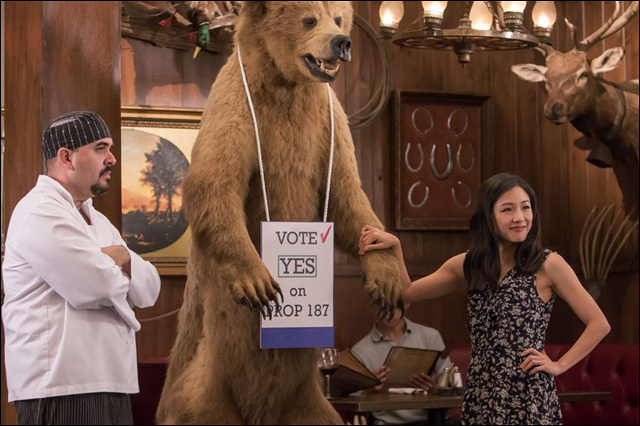 As Louis and the Cattleman's Ranch staff prepare to serve as a polling place for the 1996 election, Jessica suspects that one of the restaurant employees may be an undocumented immigrant. So when Jessica reports her findings to the I.N.S., she learns that her immigration status is also questionable. Meanwhile, Eddie and his friends have a heated debate over who killed rapper Tupac Shakur. Guest starring are Jillian Armenante as Nancy, Prophet Bolden as Walter, Trevor Larcom as Trent, Dash Williams as Brian, Evan Hannemann as Barefoot Dave, Noel Gugliemi as Hector, Nick Gore as Ned, Kathleen Rose-Perkins as Mey-Mey, Ken Marino as Gus, Paul Mabon as I.N.S. Officer, Daniel Edward Mora as Eduardo, Armando Molina as Raul Ruiz and Christopher Kriesa as Jack Clovis. "Citizen Jessica" was written by Sanjay Shah and directed by Claire Scanlon.